I’m writing today from my desk. In my home. With my lamps, and my couch, and my fuzzy purple blankets, which sound really tacky but go surprisingly well with the room. This is a big deal. Really, it is. It’s a major departure from my last few submissions, which were all written the same way: hoisting my laptop above my head in a hotel room closet so I could reach the eleven square inches covered by the wireless Internet. In other words: I’ve made it through the roadtrip alive. 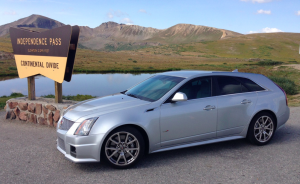 “What roadtrip?” you ask, pretending that you did not see – and ignore – my last few posts about how I drove my Cadillac CTS-V Wagon across the entirety of the United States in order to sit in traffic at Monterey Car Week. Yes, that roadtrip. Now it’s over. But before you can bid my V-Wagon roadtrip farewell and concentrate on reading something informative written by Travis (hah! ), I’ve decided to write one last post summing up a few highlights of driving across the country – and back – in a 556-horsepower Cadillac with taillights the size of small children. Here goes. But to satisfy your curiosity, I’ll define it even more technically here. 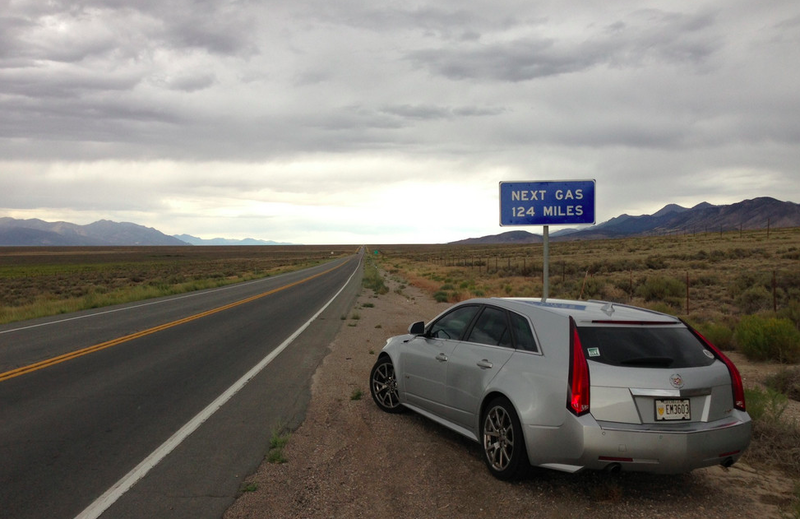 We drove 6,285 miles, which – for you metric Jalopnik users – is roughly 10,000 kilometers. In that time, we used 356.151 gallons of fuel, which – again converted for the metric folks – is about 87 kilopascals. This translates to 17.65 miles per gallon, or approximately 27 liters per sixpence. Now, I know what you’re thinking. You’re thinking: Couldn’t you just type the conversions into Google rather than make up things like “liters per sixpence?” And unfortunately, the answer is no. You may also be thinking: That sounds expensive! And, yes, it was. We paid an average of $4.05 per gallon, which means we spent a total of $1,440.85 on fuel. The car never made it more than 300 miles between fuel stops, hitting that number only once: from Salina, Kansas, to Columbia, Missouri. 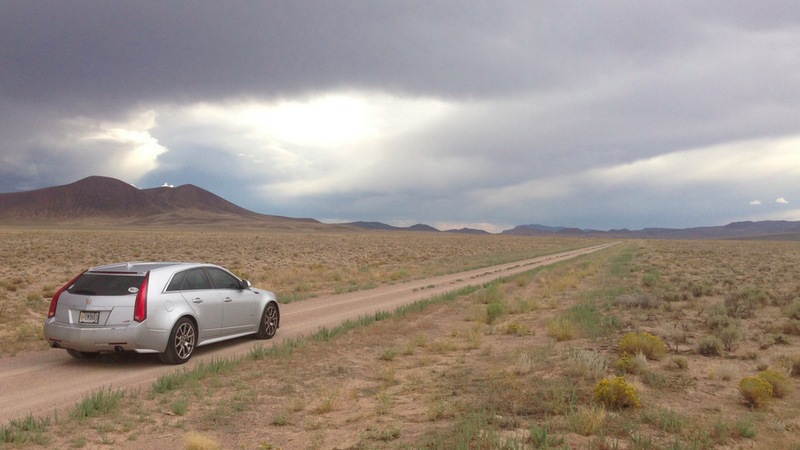 The truth is this: when you’re on a 6,300-mile roadtrip, you pace yourself. What I mean is, you have fun for the first hour or two, then you set your cruise control 10 over the speed limit and angrily curse every time a truck going 62 miles per hour pulls out in front of you so it can pass a truck going 61 miles per hour. With that said, I did open it up a few times. 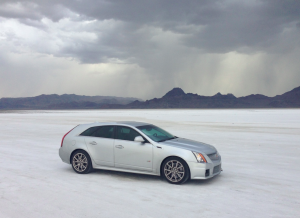 I got above 150 miles per hour on the Bonneville Salt Flats, and my girlfriend had her first triple-digit experience there, too. 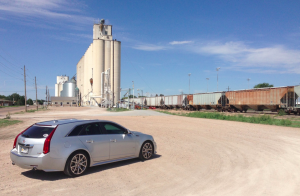 And there may have been an incident in Kansas where a guy in a 535xi learned the silver station wagon doing 84 in a 75 zone shouldn’t be underestimated. Aside from that, I kept things pretty reasonable. We drove through 17 different states and approximately seven million rural counties, all of which are hungry for revenue from out-of-staters driving expensive luxury cars. I wasn’t stopped once, though I was briefly yelled at by a police officer in Pebble Beach who mistakenly thought “directing traffic for a car show” would be a stress-free way to earn some overtime pay. Now that I’ve seen the entire country, minus the parts that don’t matter, such as Delaware, many people have asked me what I enjoyed the most. The true answer to this question is, of course, Monterey Car Week, but I can’t say that without sounding like a car-obsessed freak who drove 6,300 miles to look at some Ferraris. So instead I will give a more diplomatic answer, which is that the diversity and vastness of the United States was a welcome and enjoyable delight on our splendid vacation. This covers up the fact that the best part of the trip, aside from car week, was seeing the “Welcome to Georgia” sign and knowing that, in a few hours, I would be wrapped up in my purple blankets watching Pawn Stars. OK, fine, I have an actual answer to this question. The Grand Canyon was the most beautiful thing we saw. A close second was Monument Valley, followed by Big Sur and the Rocky Mountains. We enjoyed the Great Salt Lake (we waded in) and the Salt Flats. And I was pleasantly surprised by the desert in both Southern California and Nevada, where you can stop the car in the road, walk around for a while, and take in what has to be the most vast, empty land in the United States. Yosemite was a slight disappointment, largely because it smelled like an airport smoker’s lounge the entire time we were there. We also loved the cities we spent time in: Laguna Beach, Aspen, and Monterey. Honorable mention goes to St. Louis, which is a surprisingly nice place considering most people I know who grew up there get down whenever they hear a loud popping noise. Well, the car made it back in one piece. Mostly. The brakes feel like I’m driving over a rough pavement test course every time I try to slow down. They did for the entire trip. This is especially disappointing because I took it in a few days before I left, and not a word was said about brake wear. The right rear tire is still leaking air. This is the second right rear tire that’s been leaking, which suggests that maybe I didn’t need to replace the first one. The car needs an oil change. And the plastic mounts that protect the lower part of the front bumper are hanging loose. It’s at the dealer right now for the fourth time since I bought it less than 60 days ago. Of course, there’s a benefit to all this, namely that for the next few days I’ll be driving the world’s fastest Cadillac SRX. This trip was a blast, and I highly encourage anyone considering a roadtrip to get out there, see the country, and have fun. Just remember that all this enjoyment may cost a few cubic centimeters of money. And for God’s sake, don’t stop in Big Sur for fuel. 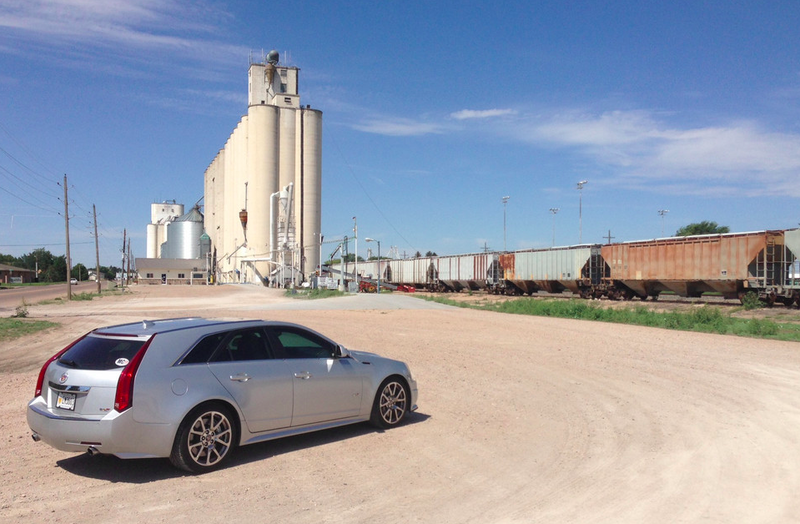 Click here to see a really cool photo album of the car parked in front of things. Click here to see a rough outline of our route. You missed some excellent places in Utah! Limited to but not including: Zion, Bryce, Arches, and Moab. I hope that you have been to those places already; if not visit them on your next trip! P.S. I’m not a Utah native either. They are legitimately incredible places. Great writing, as always, Doug. 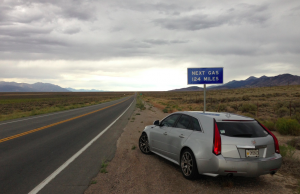 But I also wanted to comment on how much I have enjoyed the photos of the car across the country. That is one crazy design of a car, I think it was made to be photographed in front of state signs. Thanks for the enjoyable articles. Thanks for the kind words. I absolutely loved taking the photos. It was really fun to position the car in various spots, and some of the pictures turned out REALLY well. Other than fuel economy, what did you think about the car? 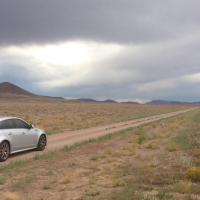 There are a few other posts that get more into it, but the car was exceptional for roadtripping. Comfortable, smooth, powerful when necessary, and ample room for bags and tires. I’d do the same trip tomorrow in the same car. OK, perhaps a little too personal, but the biggest question of any trip that long is “Are you and your girlfriend still on speaking terms?”. So, now on to the next fun used car, or will there ensue more Tales of the V? More tales of the V, though I think we’re going to focus on some of the more unusual aspects of life – like a ‘how much can we fit in the back’ challenge and a run on the dragstrip. Then on to the next one. Girflriend and I still happily speaking. The trip was her suggestion! She is crazier than me – although she knows next to nothing about cars. Probably a good thing.